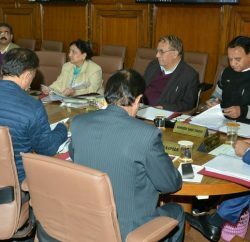 Himachal Pradesh cabinet which met here today under the chairmanship of Chief Minister Virbhadra Singh, accorded approval for making amendments in the Skill Development Allowance scheme (SDA). Chief Minister had made this announcement during State Level Independence Day celebrations at Mandi, with a view to bring maximum youth of the State under the ambit of this scheme. As per the amendments in SDA scheme, the eligibility criteria will be 18 to 35 years of age, as on the date of application instead of earlier provision of 25 to 35 years of age. The educational qualification has also been lowered to matriculation instead of 10+2. The beneficiary should be registered with any employment exchange in the State as on the date of application instead of earlier provision of minimum two years. Besides, the affidavit of the applicant of being unemployed will be considered instead of unemployment certificate issued by Executive Magistrate. The cabinet granted approval to open tehsil at Bhuntar in Kullu. It will have two Kanungo Circles namely Bhuntar and Rupi and 17 Patwar Cirlces. With the opening of this tehsil, around one lakh people will be benefited. This decision has come in fulfillment of Chief Minister’s announcement on State Level Himachal Day function held at Kullu, this year. The cabinet gave its nod to open health sub-centre at Gram Panchayat Tung in district Mandi with creation of one post of Male Health Worker and one post of Female Health Worker. This health sub-centre would benefit 4350 people of the area. It also approved primary health centre at Panjawar in Haroli tehsil of Una district and filling of one post of Medical Officer and one post of Pharmacist to make it functional. 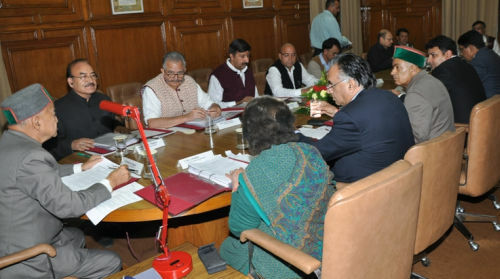 The cabinet gave its approval to dispose-off cases seeking employment on compassionate grounds. It also approved to revise the existing policy to the dependents of the deceased class-IV employees against class-IV post. The condition of passing the typing test has been made compulsory against class-III clerical post. The employment on compassionate grounds will be restricted to 5 percent of the total vacancies in a year. The income limit for compassionate employment in relation to dependents has been revised to Rs. 1.25 lakh from existing Rs. 75,000. The compassionate employment on medical grounds has been restricted to 45 years of age. It gave approval to grant permission to Forest, Horticulture and Fisheries departments to use polythene bags of suitable sizes for nurseries and transportation of fish seeds etc. during the next two years in relaxation of the ban imposed by the State government on use of non-biodegradable polythene bags. 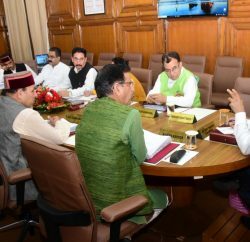 The cabinet gave its approval to introduce Himachal Pradesh Municipal Corporation (Amendment) Bill, 2013 and Himachal Pradesh Municipal (Amendment) Bill, 2013 in the ensuing Vidhan Sabha session. The Himachal Pradesh Municipal Corporation Act, 1994 and Himachal Pradesh Municipal Act, 1994 were amended in 2010 with a view to introduce the direct election system for the office of Mayor and Deputy Mayor of Shimla Municipal Corporation and for the office of Presidents and Vice Presidents of Municipal Councils/Nagar Panchayats, on the analogy of Panchayati Raj Institutions. But, the system of direct elections has not proved successful in prevailing circumstances. Thus, the amendment has been proposed to speed up the execution of developmental works and restore the old system of indirect elections. It decided to grant relaxation in eligibility criteria to the Anganwadi Helper for the post of Anganwari worker. The condition of total annual family income of Rs. 20,000 at present has been modified to the extent that the honorarium being paid to the Anganwadi Helper will not be considered for her family income in case she applies for the post of Anganwari Worker. The decision was made to cancel the MoU signed for construction of ropeway between Anandpur Sahib-Shri Naina Devi Ji. It has been decided to call Expression of Interest (EoI) for setting up of this project with-in the State through PPP mode. The cabinet approved for outsourcing of bridges from Package-1 Mehatpur-Una-Jhalera-Amb road to Package-2 Una-Bangana-Badsar road as variation/additional work on the rates quoted for the Package-2 plus cost escalation as per their contract agreement, so that the matter can be taken up with the World Bank for approval. 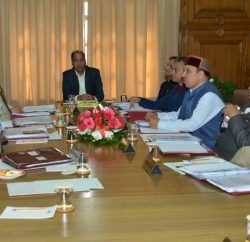 The cabinet gave its nod to online declaration of intra-State movements of goods-Amendment of Himachal Pradesh Value Added Tax Rules, 2005. Now, besides manufacturers/dealers dealing in sale of iron, steel, plywood and sunmica, the manufacturers/dealers dealing in medicines, electrical items, edible oils, marble, furniture and timber will also be included for mandatory e-declaration of goods having value of Rs. 30,000 or above during intra-state transaction of goods. The cabinet approved the Fertilizer Policy for the year 2013-14 with a view to optimize the use of fertilizers and to ensure uniform prices throughout the State. A provision of Rs. 678 lakh has been made by the government under the policy. It gave approval to revised operational guidelines of Apple Rejuvenation Project. Ex-post facto approval was also granted for apple procurement in 60 kgs bag during current year under Market Intervention Scheme, 2013, while procurement will be done only in 18 kgs bags/crates from next year. It was also decided to increase procurement centers from 260 to 270. The cabinet gave its approval to amend Motor Vehicle Act for implementation of fitting all commercial vehicles with Vehicle Tracking System (VTS) in the State. Approval was granted to create 18 posts of various categories in the directorate of Health Safety and Regulation. These includes 2 posts of Assistant Drug Controller, 1 post of Superintendent Grade-II, 3 posts of Senior Assistant, 6 posts of Drug Inspectors and 6 posts of clerks. Cabinet approved 8 posts of various categories for newly created Tehsil at Ispur in Una district. Decision was taken to grant 4-tier pay scales to H.P State Forest Services prospectively on the analogy of Punjab pay scales based on the recommendations of the 5th Punjab Pay Commission. It has been decided to include JBT, BEd, MEd, BBA, Hotel Management, BCA and MCA for grant of advance for professional courses to the children of State government employees. It also approved grant of Grade Pay of Rs. 4400 to the Law Officers of the government departments prospectively. Cabinet gave its approval to give one time relaxation in Recruitment and Promotion Rules for the post of Radiographer, Lab Assistant/Lab Technician and Pharamacist. Educational qualification will be taken as matriculation for filling these posts. The cabinet gave approval to purchase 11 light vehicles and 12 motor cycles for State Police under State Police Modernization Scheme.